I’ve got more photos from NAHBS from Saturday, but need make a correction from my last post where I described Jeremy Shlachter’s Gallus Cycles cool rando bike as being “fixed, no brakes”. I was mistaken. I didn’t see the coaster brake lever tucked discretely behind the opposite chainstay. Now I’m pretty sure that he used the Sturmey Archer S2C hub. I really liked that bike with its dual headlights, handmade rack, and wooden fenders. 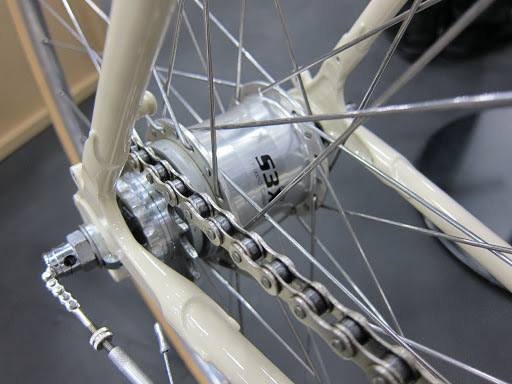 This bike was built using the Sturmey Archer S3X hub which is a 3-speed fixed wheel hub. Since I’m a bit of a fixed wheel fan, that hub attracts. Steve asked about the shifter, and the apparent absence of a “travel agent” to help with cable travel issues. 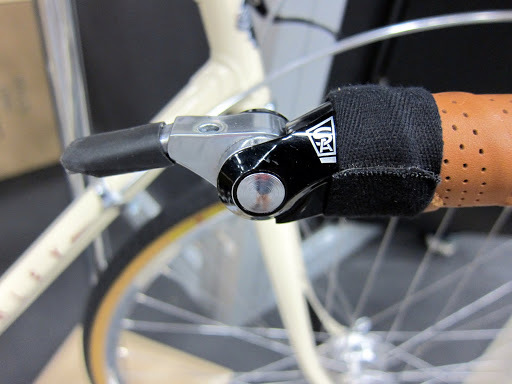 I believe this matter is addressed in this case because a SA brand bar end shifter was used. This is an elegant arrangement, and now I’m even more intrigued by the S3X hub. I didn't know SA did a bar-end shifter. It raises the interest level in that three speed internal hub for a drop-bar bike. If they only made a close-ratio version! Looking at the SA site, they have a 3 speed hub with a 160% ratio rather than the 177% that is more typical for their 3 speeds. The close ratio version should be better suited to a place such as North Texas that is relatively flat. It'd be a lighter solution than the Shimano one that involves a lot of gears you'll never use. It's always nice to find inspiration.